I am posting my weekly entry a bit earlier than normal this week to make time for my Christmas Eve and Christmas Day events – I’ll tell you all about those next week. 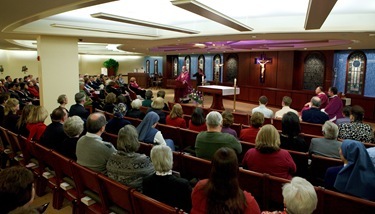 On Thursday afternoon, I celebrated a Mass for our staff here at the Pastoral Center to start our annual Advent Gathering for employees. 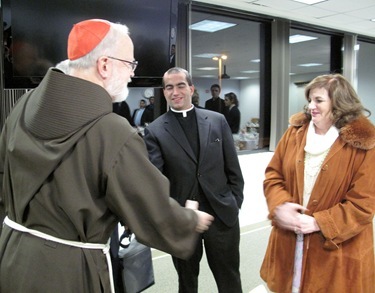 It was my chance to thank them for all that they do to help the parishes and people of the archdiocese. Afterward, there was a light reception upstairs. Also this week, my immediate staff joined me at the Cathedral for Mass, followed by an Advent, pre-Christmas dinner. We are so grateful to the wonderful staff that we have that facilitate the work of this office, which is so variegated because of the many different programs, problems and opportunities that surface here. It’s their hard work and fidelity that make it all possible. I was happy to be able to recognize that. 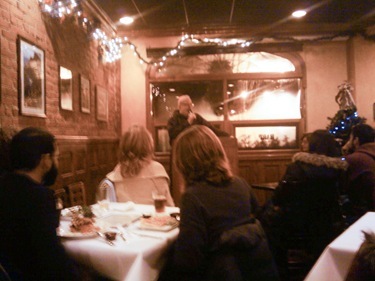 That evening, I went to Boston College for an event for St. Columbkille School in Brighton. Msgr. Fay, the pastor of St. Columbkille’s, Father William Lahey, the president of Boston College, Dr. Mary Grassa O’Neill, our Superintendent of Schools, and representatives from the Catholic Schools Foundation were all there for the program to recognize all the help in this wonderful alliance that has been able to save Catholic education in Brighton. As part of the celebration, the students from St. Columbkille’s sang Christmas carols. It was an excellent evening. 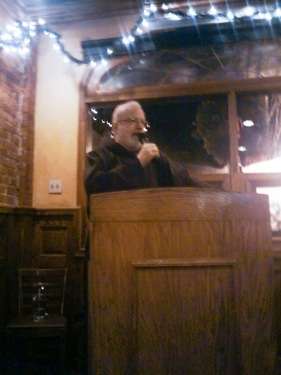 I closed out my evening by speaking at Theology on Tap at The Green Briar, an Irish pub in Brighton. We had a very large turnout of young people for it. 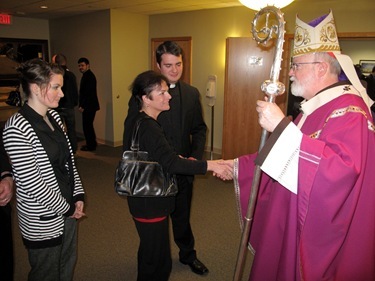 The youth minister at St. Columbkille’s and Msgr. Fay were involved in the organization of the evening and helped make it a success. I gave them a talk on the mercy of God and the Sacrament of Confession, and then we had questions and answers. I spoke for maybe an hour and had a half-hour of questions. It was a wonderful group. It was on a cold, cold night. I was happy to see that so many young people turned out. 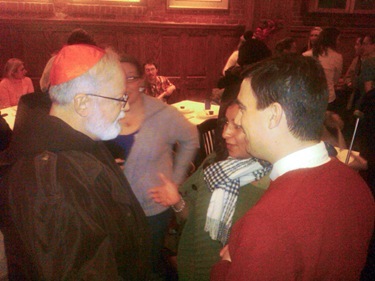 These Theology on Tap sessions have been important moments for people to learn more about their faith and to gather with other young Catholics. On Saturday morning, I presided at a rite for the First Neocatechumenal Community at Our Lady of the Assumption in East Boston. 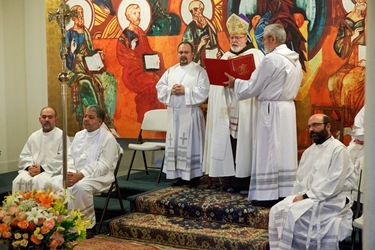 The Neocatechumenal Way is a parish based post-Baptismal itinerary of Catholic formation that gradually initiates members in all aspects of Christian life, following a praxis similar to the early Church’s baptismal catechumenate. 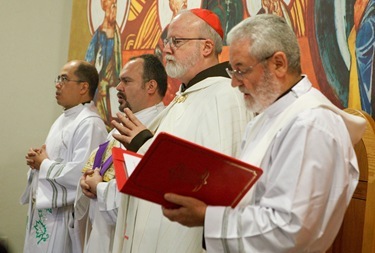 This particular community, the first one that started in Boston, is at the step of the third “traditio,” that is the handing over of the Lord’s Prayer. In years past, they were presented with the breviary, which they pray every day, as well as the Creed. 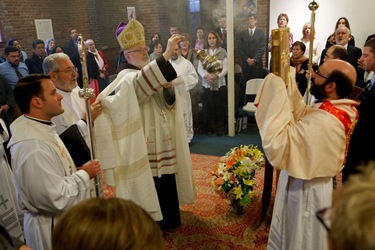 I shared with them some thoughts about this traditio of the Our Father at Baptism and Confirmation, and the custom of arcanum in the early Church. Following that, we reflected on the meaning of the beautiful petitions in the Lord ’s Prayer. 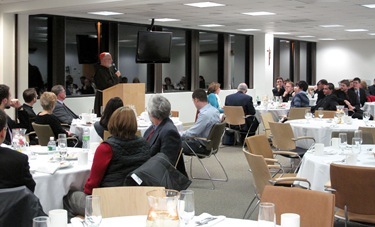 Later that afternoon, I celebrated Mass with our seminarians and their families here at Pastoral Center. 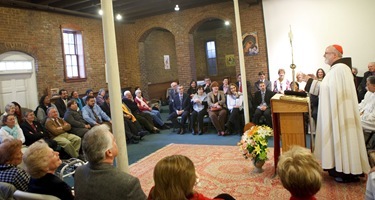 The gathering was organized by the Vocations Office. Some years we have had picnics (Of course in warmer weather!) and it’s always hard to find a date that’s good for everybody. This year, there were the warnings of snow, and many people called in at the last minute to let us know they didn’t think they would be able to make it. So, the group wasn’t as large as it might have been but it was nice to get to meet some of the parents, brothers, and sisters of our seminarians. 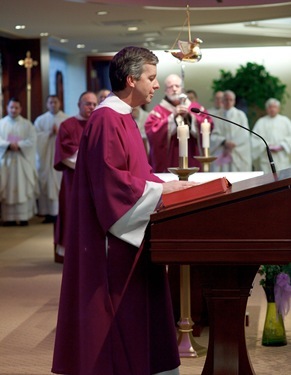 On Sunday morning, I said Mass at the Cathedral for the ARISE program. Father Alejandro Lopez-Cardinale, who is the Hispanic/Latino Coordinator for RENEW International, came up from New Jersey to be at this Mass. 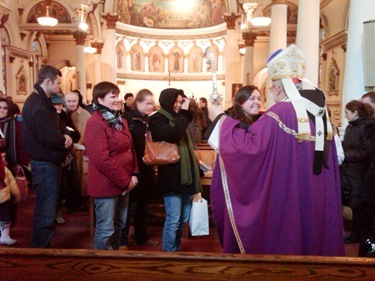 Originally, we had hoped the Hispanic people participating in Arise at the various parishes would come together at the Cathedral, but with the snowstorm it was what you could call a skeleton crew, about 50 or 60 people there. From the cathedral, I had a parish visitation at St. Leonard’s in the North End. 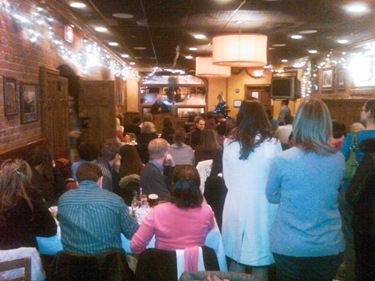 There was a very nice turnout despite the snow. A lot of people in the neighborhood were able to just walk to church. We were able to visit Father Michael Bercik, who is there at St. Christopher Friary and is very ill. I gave him a blessing and met with his family. 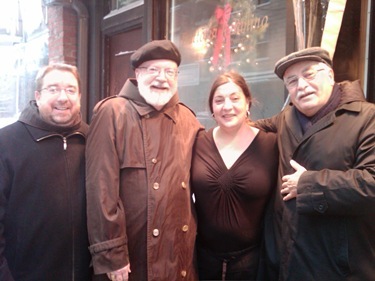 Afterwards, the friars took us to lunch at Il Panino on Parmenter Street, one of the many Italian restaurants in the North End. I had an excellent Italian meal. Thank you to Maria and all the staff who were so good to us! On Monday I visited the Redemptoris Mater Seminary, and the seminarians sang some beautiful Christmas carols, including O Holy Night that I want to share with you. Now a little something for those who are Santa Claus fans and who have a devotion to the Holy Father’s camauro: Father Marino, a friend of mine from the Archdiocese of Miami, shared this photo with me, which I consider priceless. In the Christmas spirit and for the young at heart, we are including it in the blog. Finally, as we prepare for Christmas Eve and Noche Buena, I assure you that you are all in my prayers. I want to share with you this greeting, which I gave on Vatican radio. I liked reading this week’s blog! I enjoyed watching the Holy Night video and how it showed the happiness of Jesus’s birth. I hope you had a blessed Christmas! 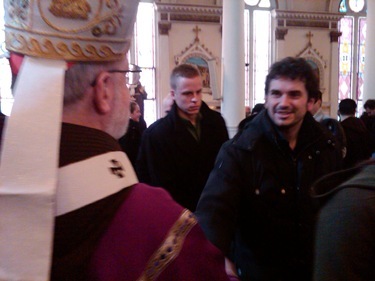 I hope that Father Michael Bercik gets well soon! I loved your blog and the pictures were beautiful! 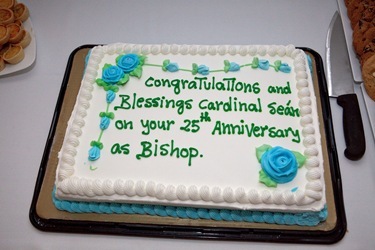 I hope you can come and celebrate a mass with us soon! This week’s blog was very interesting! 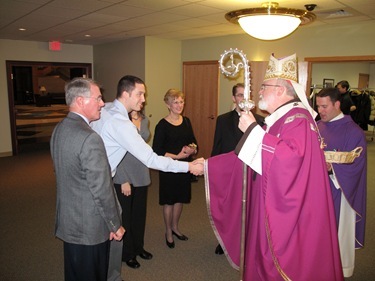 I will keep Father Michael Bercik in my prayers and I hope he feels better soon! Thanks for keeping everyone posted in the Religious world. I cannot wait for next week’s blog! I’m a bit late in saying this, but Merry Christmas! I hope that Father Michael Bercik gets better soon! It was so nice of you to visit him and his family, and to give him a blessing. The semitarians at the Redemptoris Mater Seminary sang beautifully! It must have been wonderful to visit them! I loved your blog this week! It looks like you had a nice Christmas Eve and I loved the beautiful pictures. I can’t wait to see your next blog! I enjoyed reading this week’s blog very much! From the pictures I saw, Our Lady of the Assumption is very beautiful and was decorated very well! 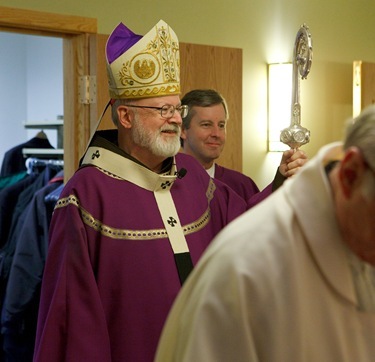 I hope that Father Michael Bercik has a quick recovery. I hope to see you at mass at Saint Paul very soon! Even though there was a snowstorm, it looked as if you had a good turnout for all the events you attended on Christmas Eve, which is always a good sign! That video of O Holy Night is absolutly beautiful!!!!!! What wonderful voices they have! Thank you for these pictures and the wonderful blog. I watched the video of the seminarians singing O Holy Night. They did a beautiful job. 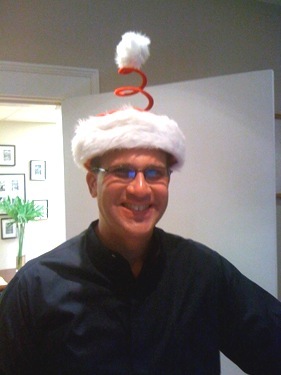 Listening and watching the video reminded me of the Christmas cheer that filled the air just a short while ago. Thank you for the wonderful blog! I hope that Father Michael Bercik gets well. 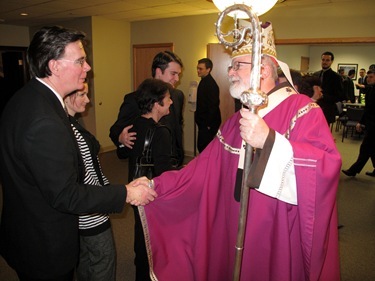 I hope that you are able to celebrate a mass with the St. Paul community. This weeks blog was very interesting. 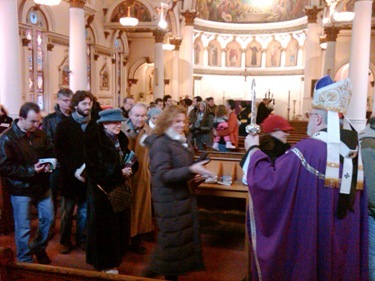 That was so nice that people attended St. Leonard’s in the North End despite the snow. The pictures were great. Your staff who joined you at the Cathedral for Mass, followed by an Advent, pre-Christmas dinner, were really wonderful. Can’t wait for the next blog! 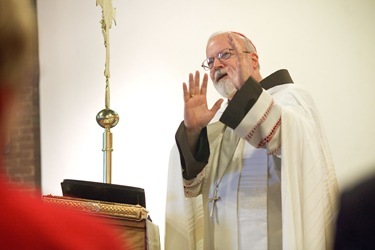 My dear Cardinal O’Malley, though I am but a poor inconsequential layman, may I suggest to you that this attack on the Holy Father is in many ways a reflection that our society, indeed our Holy Church, has in the last 40 years gone off the tracks and lost the sense of the sacred. 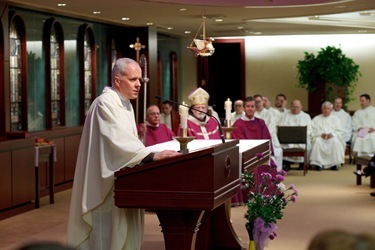 Nothing is sacred anymore, not our liturgy, not our Pope, not any of the traditional devotions we had before the radical changes invoked after Vatican II. Has the “let it all hang out” generation, in fact, done exactly what that phrase implies so that attacking the Holy Father is somehow seen by the radical fringe as “Justified”. When I was a growing up in the Archdiocese of Boston from 1941 to 1962, I remember the May devotions to the Blessed Virgin Mary the Mother of God, the Rosary, said every morning in Catholic grade school, led by nuns in their penitential habits with Archbishop later Cardinal Cushing being heard on the radio and Catholic Mass where the entire congregation was on their knees reverently adoring the sacred mysteries taking place before their very eyes. This was the practice then but what is the practice now? It’s a rhetorical question, my dear Cardinal, but I ask you to solemnly reflect on WHY it is what it is now and what you may do personally to reverse trends towards loss of the sacred. Could it just be that a return to the Traditional Mass and devotions to the Blessed Mother are called for? I think so. Tengo un hermano sacerdote desde hace un año en Lynn. Sigo su trabajo pastoral por esta bella página que recomiendo en mi blog católico. Desde Sevilla (España) deseo que su labor como Pastor siga siendo bendecida por este Dios-con-nosotros que se hace presente gracias a esta Iglesia cercana que usted representa. Que Cristo siga cuidando de su archidiócesis. Cuente con mis oraciones. 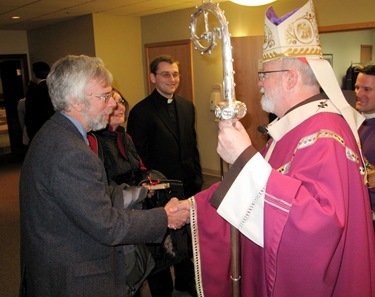 Dear Cardinal Sean: I hope that you had a blessed and joyful Christmas. I really enjoyed this post and the beautiful pictures. I live in a small town in Northeastern Pennsylavania and am active in my parish. I teach 8th Grade religion at my parish. I am also in the choir. We sang for a 4 PM vigil Mass and also midnight Mass. Today our pastor said that there were 1400 people at the vigil Mass (in the church and overflow in our basement with the Mass televised). We have a wonderful diverse parish, we have a Polish Mass every Sunday and a Spanish Mass on Tuesdays. I attend both of these Masses from time to time. I am proud of my diverse parish, along with our Polish and Latino community. we also have numerous black, gay and Asian parishioners, as well as a lot of Irish and Italians, of course. 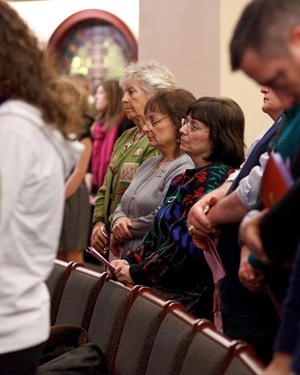 I think we may be one of the most diverse parishes in the Scrantonn diocese as well as being a welcoming Church. I pray that you and all the good people of your diocese have a blessed Christmas season!! FELICES PASCUAS PADRE SEAN! MIL GRACIAS POR SU “BLOG” Y POR INCLUIR SUS HOMILIAS. PAZ Y BIEN PARA USTED Y TODOS LOS FIELES DE BOSTON. 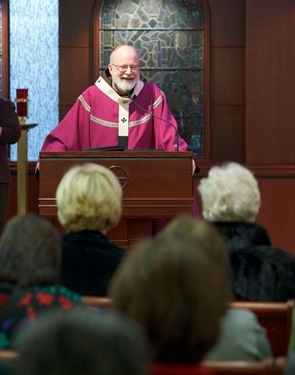 Dear Cardinal Sean: Thank you for showing the mercy of God through your ministry. 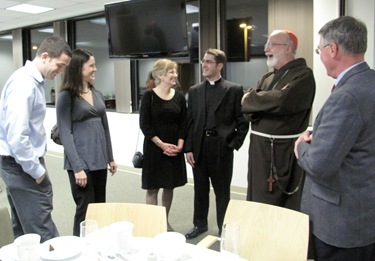 You have always been a healing presence from those early days at that little office of the Spanish Catholic Center in DC to your plea for compassion and defense of the “seamless garment” of Catholic moral teaching today. You have always been, and continue to be a true inspiration. From your former student. Much love through this season of Christmas. Rick.